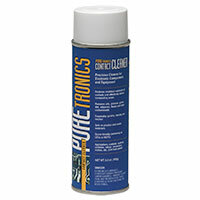 Plastic Safe Contact Cleaner - 5.5 oz. Restores electrical continuity of contacts found in electronic applications. Removes dirt, dust, fluxes, oxide particles and other contaminants. Evaporate quickly, leaving zero residue Safe on plastics. Ozone friendly containing no CFCs and VOC compliant.